Obama Eases Travel To Cuba, But Will Exiled Cubans Return? The US policy toward Cuba is changing. But whether exiled Cubans will return is a different story. The Obama administration recently “eased” travel restrictions to Cuba for those Cuban Americans who have relatives on the island. They are allowed to travel to Cuba once per year for as long as they like, moving regulations back to pre-2004 rules enacted by Bush. 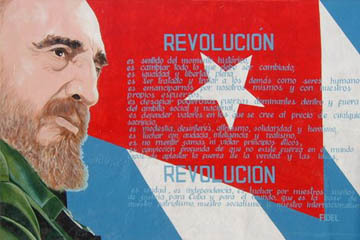 Some think this is a signal from the US government of a change in attitude towards Cuba. Others, noting Obama’s administration’s pledge that the new policy will “have no teeth,” think this is not the case. If US policy towards Cuba continues to be softened over time, what does this mean for Cuban Americans? Many of the Cubans who fled the US after Castro’s rise to power have consistently backed a policy of non-engagement with the country until Castro’s regime is overthrown. But the anticipated fall never occurred. Over the years the immigrant population has changed a lot, both because of numerous other waves of immigrants from the island and simply the passage of time…my parents’ generation have spent most of their lives in the United States and are pretty well integrated into communities here. Many in my generation have never even been to Cuba (myself included) and know Cuban culture through places like South Miami. The political landscape of Cuba has, for the most part, stayed its course. Should Cubans living in the US and Cuban-Americans hope for further removal of travel restrictions to Cuba? And would eased access to Cuba even matter to 3rd generation Cuban-Americans? If you’re set on visiting Cuba, check out How To Travel To And From Cuba, and Why You Should Travel To Cuba Now.